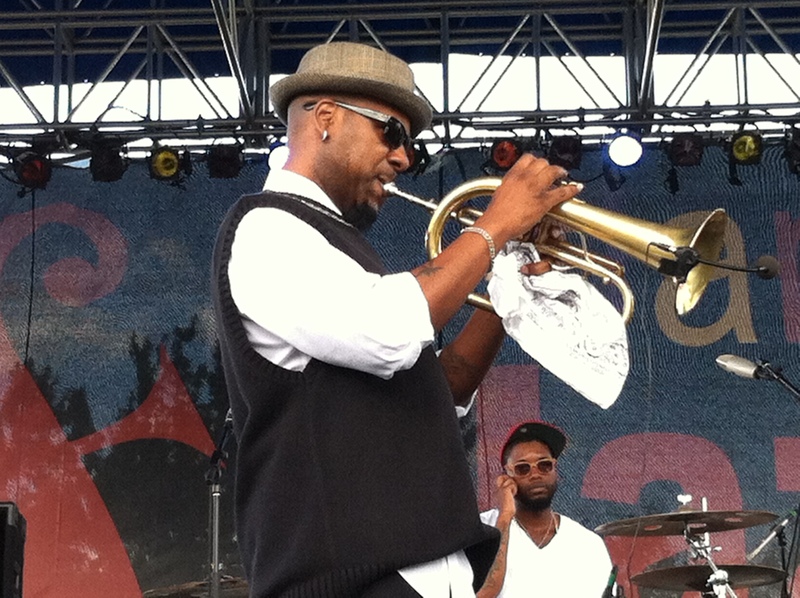 The third and final day of this year’s Atlanta Jazz Fest was the best overall. The slight cloud cover throughout most of the day cooled the temperatures a bit. We were able to get started early enough to be in place in time to hear all Mainstage performances and best of all, the music was consistently strong. 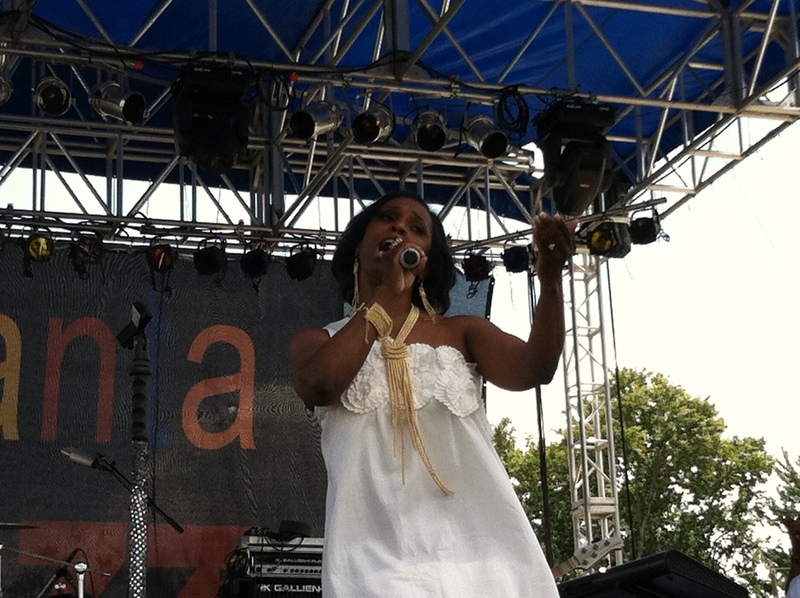 The Mainstage acts kicked off with vocalist Yolanda Rabun, who was making her AJF debut. 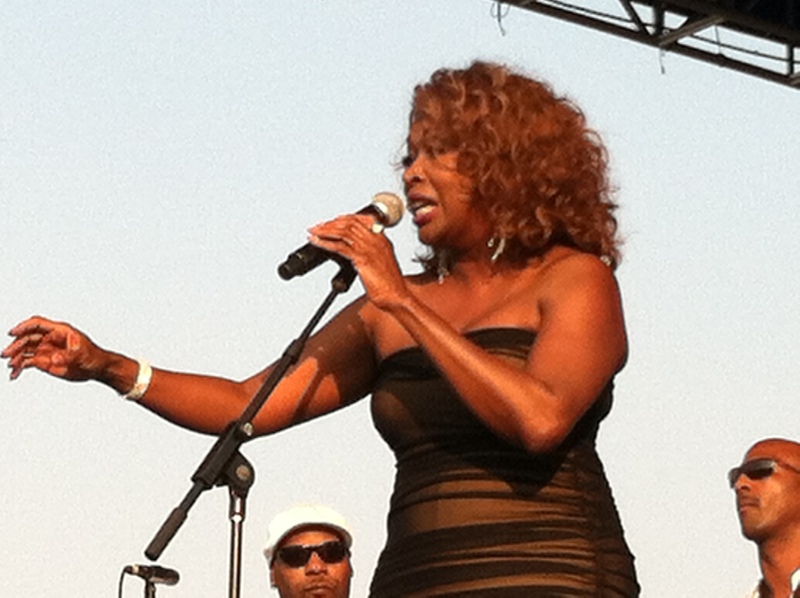 Ms. Rabun, an actress and attorney, as well as a singer; came to play; giving her all throughout her set. She is blessed with an oustanding vocal instrument and boundless energy. Her set was drawn for the most part, from her debut CD, So Real – a good idea as the album includes some very good original material, such as “The Good Wife”, “Marry You Again” and the outstanding title track. However, Ms. Rabun at times veered dangerously close to allowing her set to become too theatrical; using vocal affectations and tricks that someone with an instrument as good as hers does not need to use, in order to effectively deliver a song. And her 15 minute plus take on the old Gladys Knight & the Pips tune “Friendship Train”, which included Ms. Rabun leaving the stage to dash among the blankets and chairs shaking hands with the audience; may have been too much of a good thing. In spite of this minor misstep, Ms. Rabun finished strong with a terrific version of “So Real”. 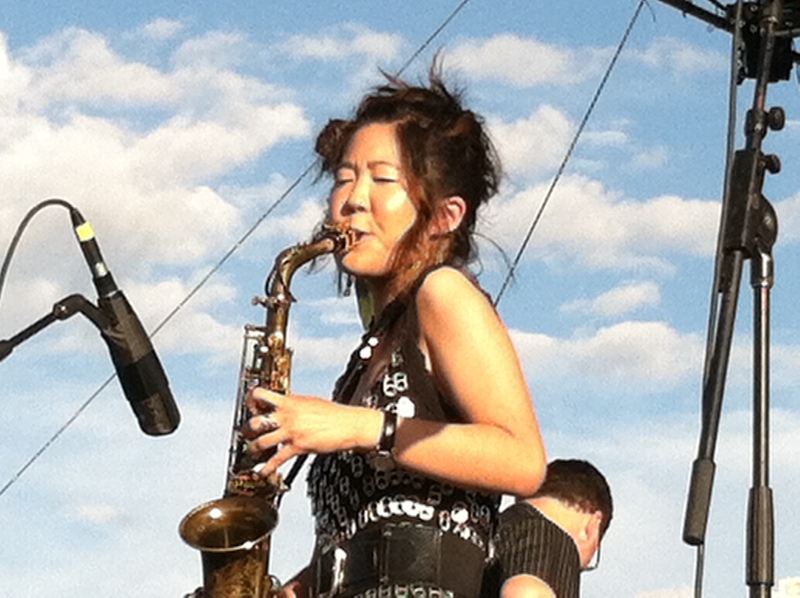 She is a very promising performer, from whom we hope to hear more at future AJFs and around the jazz world, in general. Next up was trumpeter Russell Gunn, who has taken many musical turns during his almost 20 year career, from hard bop to hip hop to jazz rock. I had wondered aloud on Sunday, which Russell Gunn would we see on Monday. I got my answer during the sound check before his set as I saw a spate of electronic instruments being arranged on the stage behind Mr. Gunn’s trumpet. This meant that we were getting Elektrik Butterfly, Mr. Gunn’s more recent aggregation, which celebrates the music of the iconic rock group, Black Sabbath. I’d heard of, but not actually heard Mr. Gunn in this setting before now, so I didn’t know what to expect. Mr. Gunn and group kicked off with a funk-rock Black Sabbath tune that was reminiscent of the type of music we got from Miles in the early seventies. It was hot, funky, edgy and it divided the audience as if it were politics. As I looked at the crowd, about half were bopping their heads and beginning to dig the groove. The other half sat there with furrowed brows, as if to say “what the hell is this?”. 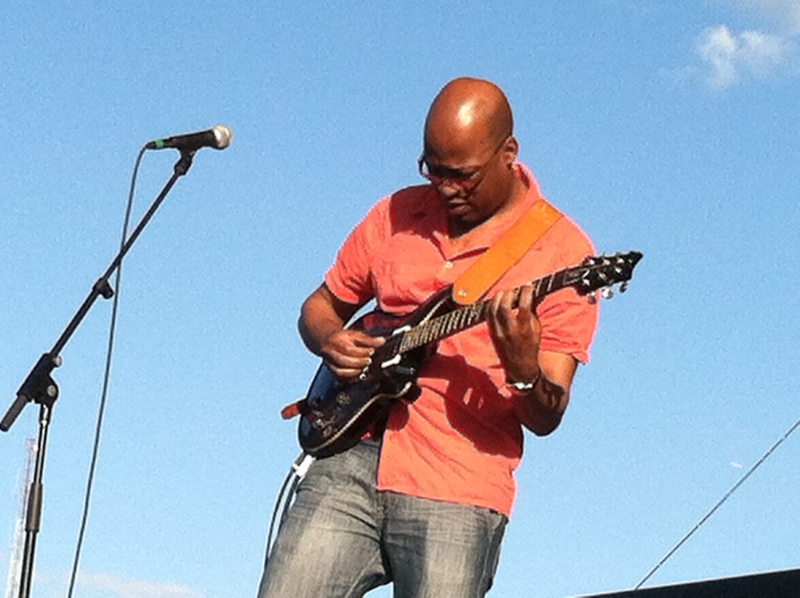 Russell Gunn and Elektrik Butterfly performing at the 2012 Atlanta Jazz Fest on Monday 5/28. As on Sunday, I missed the middle portion of Gunn’s set, for I hopped a cart ride over to the International Stage again. This time I caught the Melvin Jones Quintet. Again, the crowd, though larger than Sunday’s, was still, very attentive and enthusiastic and with good reason. Mr. Jones, an Atlanta-based trumpeter and his group, which featured Mace Hibbard on saxes, were on fire; playing some extremely good straight ahead jazz. I’ve been impressed with Mr. Jones ever since first hearing him at last year’s AJF. He did nothing to change my opinion in 2012. This was my first time hearing Mr. Hibbard, who performed with his own group at the International Stage on Sunday. He was equally impressive. Here’s a clip what I saw and heard. Grace Kelly walked into the press tent looking even younger than her 20 years, in a dress made partially of soda can tabs. She is as gracious and articulate a young woman as I have met in this business, who speaks with a stunning casualness about playing with legends such as Dave Brubeck, Phil Woods and Herbie Hancock. Yet when she took the stage, she played with the poise and artistry of someone at least twice her age. She played jazz classics and some of her newer compositions while engaging the audience in easygoing banter. Many had not heard of Ms. Kelly before her appearance, but by the time she was done, she had clearly acquired quite a few new fans – not the least of which was my son, age 11, who shyly asked me near the end of Grace’s set “Dad… Do you think that she’s attractive?” Another rite of passage – Jazzy John had his first “Jazz Crush”. Whereas the closing acts on the first two night of the AJF had been steeped in nostalgia, the final night was decidedly different. 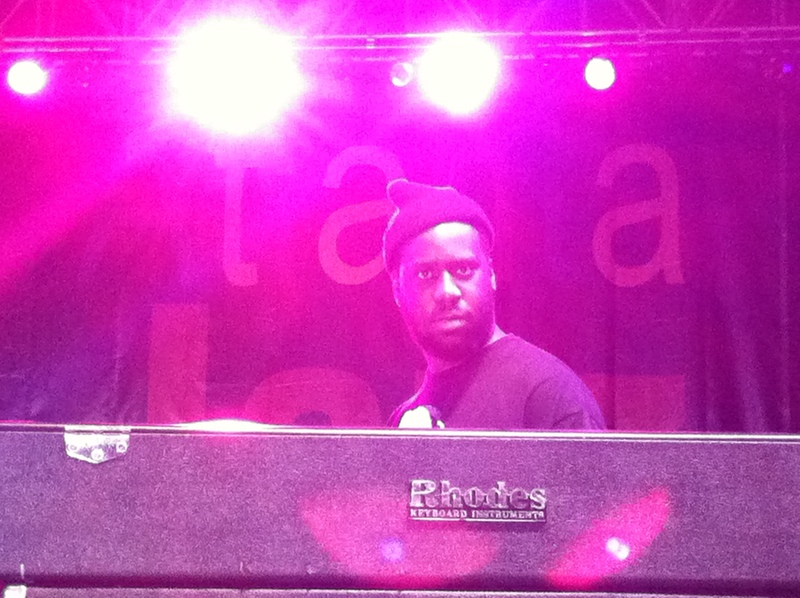 As Robert Glasper, one of the hottest performers in jazz today, was the closing artist. 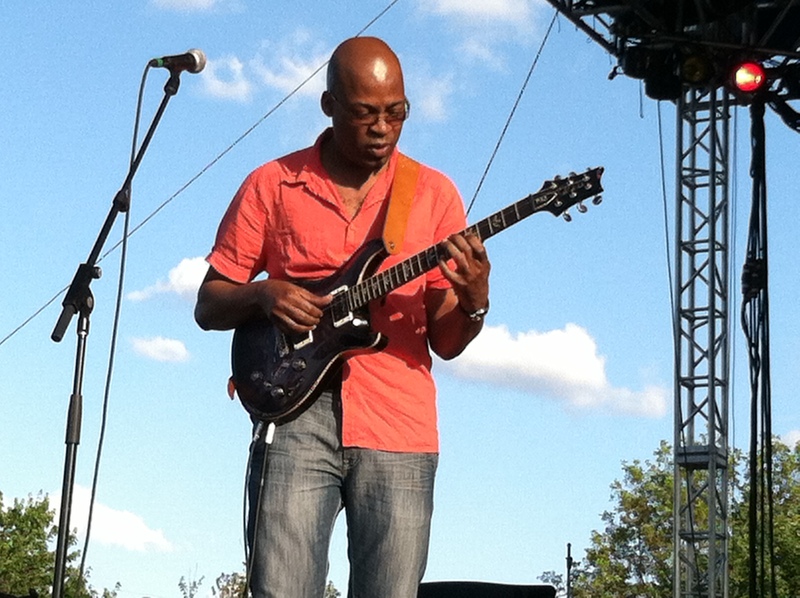 By the time 9 pm rolled around on Memorial Day evening, the crowd, which was slightly smaller than on the previous 2 nights, due in part to the coming work day for many, was also decidedly younger, a by-product of Mr. Glasper’s more youthful fan base. During his set, I found myself as excited by the music as by the implications of what was happening around me. 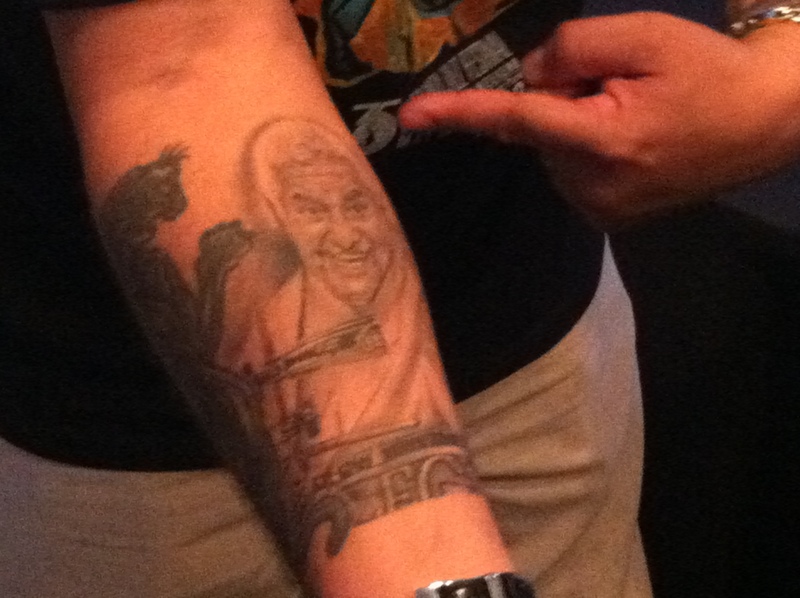 For years the death knell for jazz has been sounded. Much of it by those who complained that jazz had nothing to offer a younger audience, that could carry it forward into the middle of this century. But the audience that night was thumbing its collective nose at the naysayers. 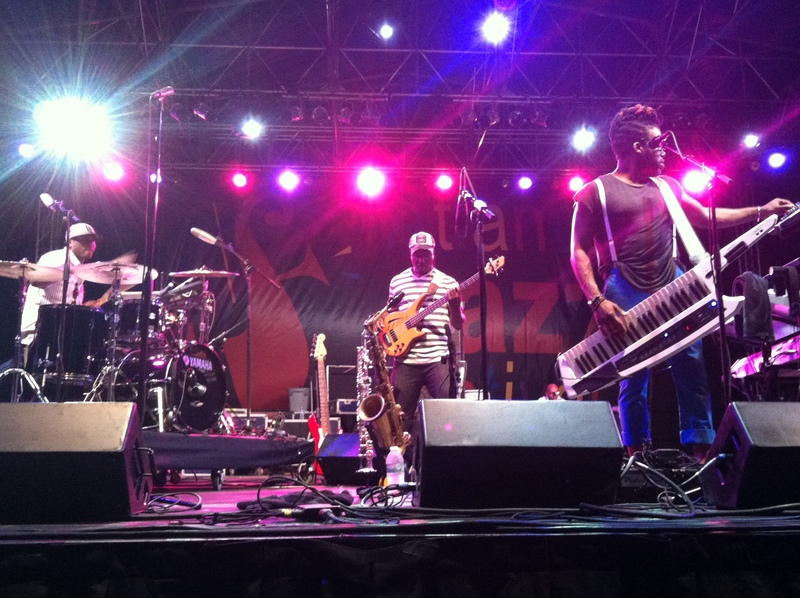 As the Robert Glasper Experiment played a set of music from his breakthrough new album Black Radio, which has a strong mix of jazz and hip-hop, I saw crowds of twenty somethings dancing and forming pockets of fist-pumping excitement, especially when Glasper and company played “Smells Like Teen Spirit”. They were digging what they heard and they wanted more. Jazz had offered them something and they were eating it up! As the night ended, due to curfew restrictions, more than either artist or audience wanting to stop; Jazzy John asked if I could download Black Radio on his iPod…For me that was as good as it got all weekend. For I know that, at least in my home, jazz does have a future. 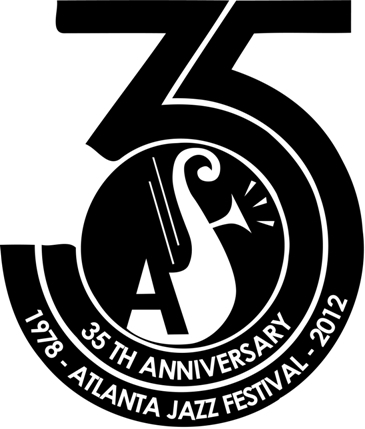 As we close the books on the 2012 Atlanta Jazz Festival, we do so with a lot of fond memories and great anticipation for the 2013 AJF. We will also make a vow to plan to spend at least one full day at the International Stage. The festival is free because the City of Atlanta has heard that this is an important cultural outreach. And they’ve heard it from those of you who are area residents. If you are an Atlanta resident, please do your part to ensure that there is a 2013 AJF and that it remains free of charge, by contacting your local government representative. That’s the best gift that you could give to jazz today. 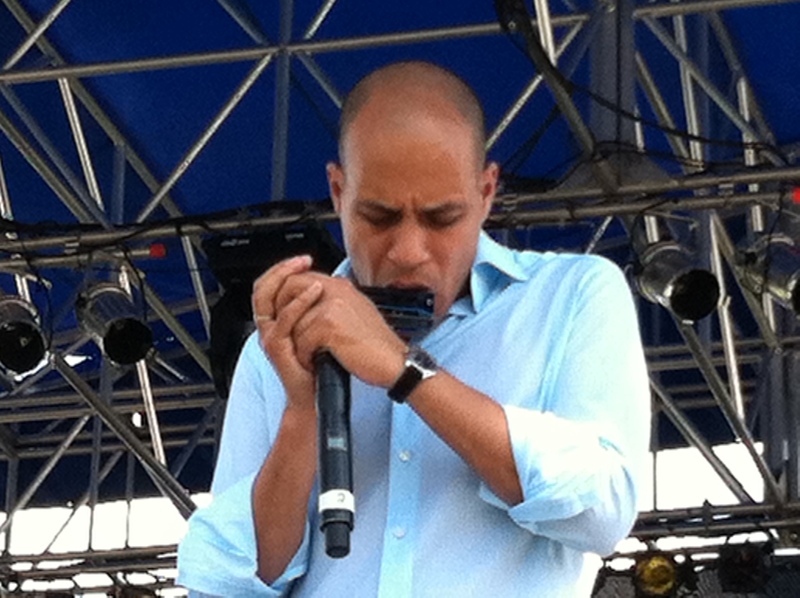 The 2012 Atlanta Jazz Fest couldn’t help but exceed its immediate predecessor, based on volume alone. 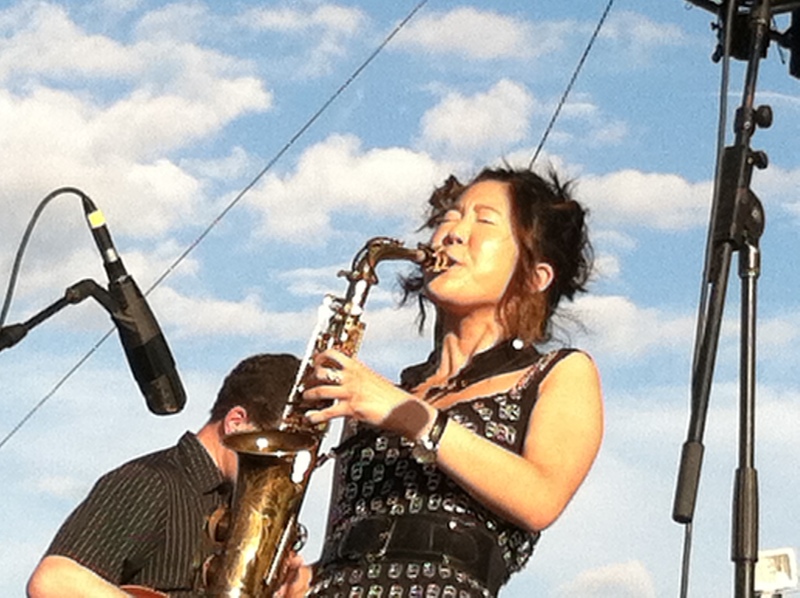 This year’s festival featured three full days of free jazz in Piedmont Park, whereas 2011 had only two. Four acts a day were featured on the Mainstage and another four on the other side of the park at the International Stage. What follows over the next three posts, will be my thoughts on the festival, opinions on performances and observations on some things that caught my attention. In addition, there are some photos and video clips. So this is not so much a review as it is a recap. Have to confess that the fam and I moved slowly on Saturday morning, while leaving Charlotte for Atlanta. So slowly that it backfired a bit. By the time we got everything we needed, dropped the dog off at doggie care, drove the 4 hours to ATL, dropped off our luggage at the hotel, found parking and walked back to the park, we unfortunately had managed to miss the first Mainstage performance by Dwight Andrews. We settled in as Cyrus Chestnut was finishing his first number, which meant that I was too late to take pictures of the “Nut Man”. A bit disappointing, but it was my own fault. As for Mr. Chestnut and his trio, they were up to their usual level of excellence. Chestnut, Dezron Douglas on bass and Neal Smith on drums have worked together long enough now that they are in musical lockstep. By the time they reached “CC Rider” the crowd had joined them, rocking along and snapping fingers as one. Another terrific performance by a great group. Between sets, we got settled in, enjoyed gourmet popsicles from a vendor who called himself “King of Pops”. My son John and I also took time to shoot our first vlogs of the weekend. 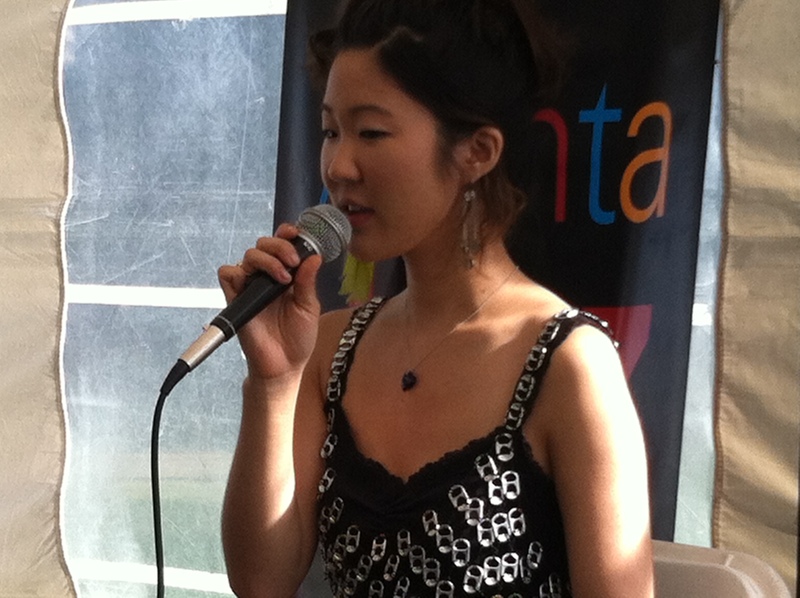 Up next was Atlanta-based vocalist Kathleen Bertrand. Ms. Bertrand, an attractive and appealing singer, immediately caught the attention of the crowd with her pop influenced jazz vocals and her form-fitting dress. Most of her material came from her latest album Katharsis, including “Wrapped Around Your Finger”, the set opener and the strong originals, “Date Night” and “Don’t Let It Die”; which is a plea for the survival of mainstream jazz. A medley of standards in the middle of the set missed the mark a bit, but Ms Bertrand recovered strongly with an appropriate set closer “Jazz at Piedmont Park”. It was a good set overall and it left the crowd feeling energetic and ready for the headliner. 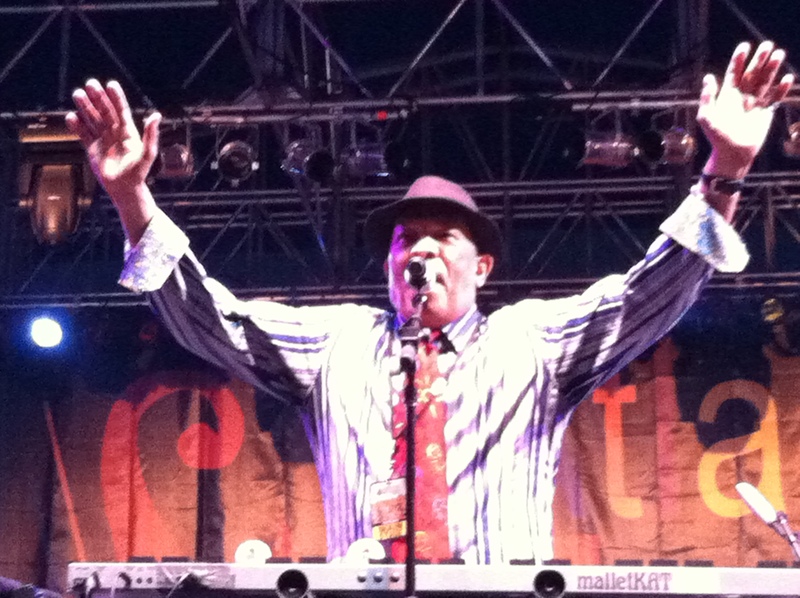 And that headliner was the great Roy Ayers. I watched Mr. Ayers move slowly backstage prior to the performance (he is in his seventies, after all). However when his introduction came and he hit the stage, he did it with more energy than many men half his age. He exhorted the crowd, sang, told stories and even played a little on the vibes. It was a virtual love fest as young and not so young on the by now packed lawn sang and danced along with “Red Black and Green”, “We Live in Brooklyn Baby”, “Searching”, “Everybody Loves the Sunshine” and the inevitable set closer, “Running Away”. Kathleen Bertrand even returned, joining Roy on vocals on one number. Roy Ayers is still a great performer and a very good vibraphonist. 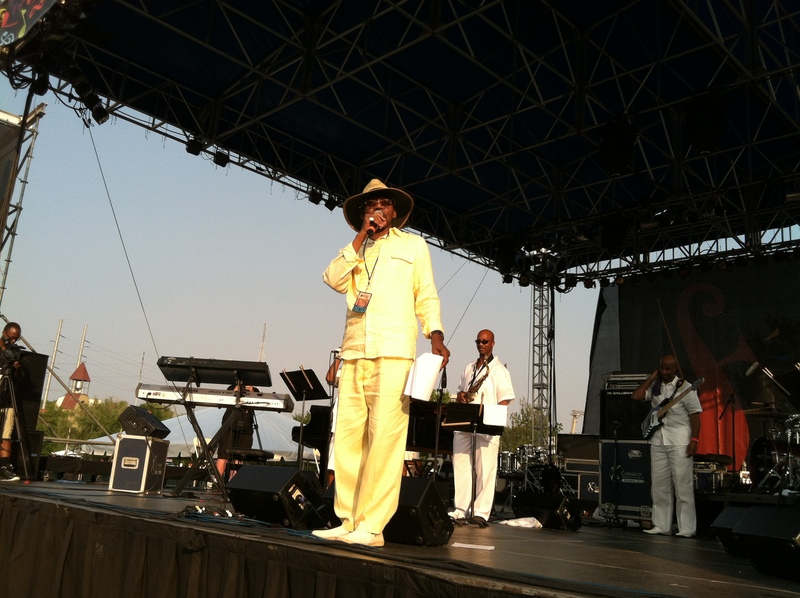 His vocals are by now, a bit shaky, but again, he is 71 and an R & B/Hip-Hop/Jazz legend. He came and gave the crowd what they wanted and we all went home happy and anticipating another great day on Sunday. And Sunday was a great day, with a real revelation for me. More on that in the next post, which will include more photos and performance footage. 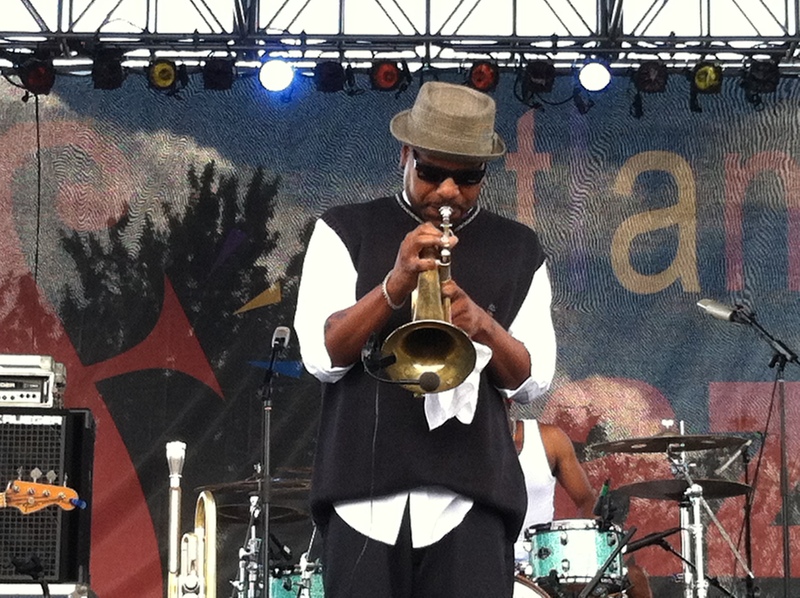 Today is the last day of the 2012 Atlanta Jazz Festival. If you’ve missed an opportunity to be a part of the great music and party, you’ve got one more chance, but you’ve got to do it today! The good news is that there is plenty of top-notch music left in Piedmont Park, starting today with vocalist Yolanda Rabun. A graduate of Atlanta’s Northside School of the Arts, Ms. Rabun is a busy lady. She has worked with R & B legend Issac Hayes, opened for Tony/Grammy winner Jennifer Holiday, and has performed in festivals in Hawaii, Japan, South Korea and throughout the U.S. She is also an actress and a practicing attorney, with a JD from Boston College Law School. 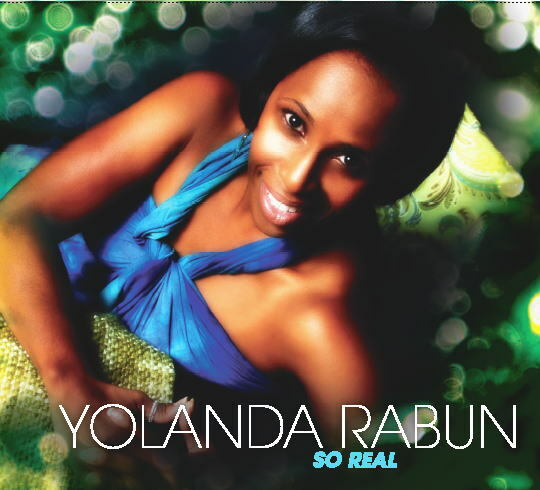 In her current home of Raleigh, NC, Yolanda is the lead vocalist with the Stanley Baird Group, one of the top jazz organization in the Triangle Area. Now she has stepped out on her own with her debut CD So Real. The smooth-jazz disc has received good reviews and is making its way up the charts. Ms. Rabun will get the last day of the 2012 Atlanta Jazz Festival off to a great start, kicking off her Piedmont Park Mainstage set at 3 pm. If you’re in the ATL, there’s no better way to spend Memorial Day. 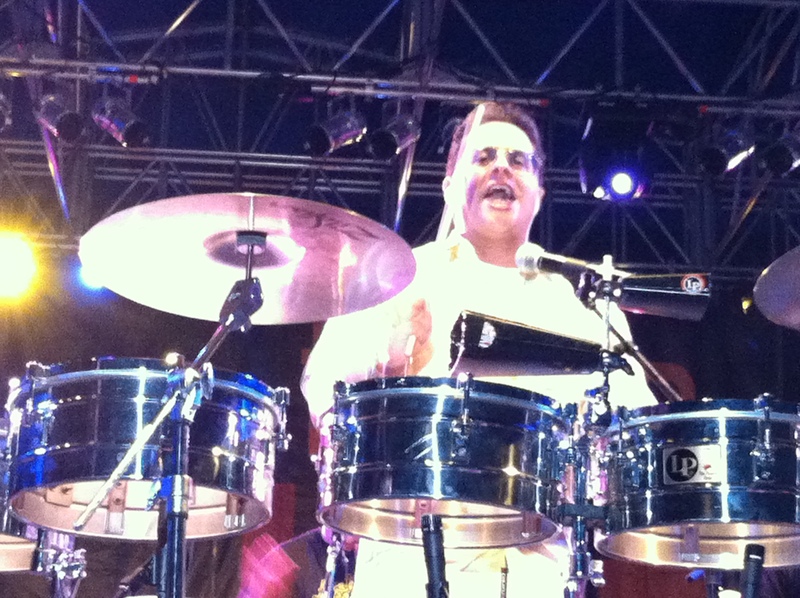 Atlanta Jazz Fest 2012 Preview – Tito Puente, Jr.
“He was just too vibrant, too exciting. There was magic in the music my father made. 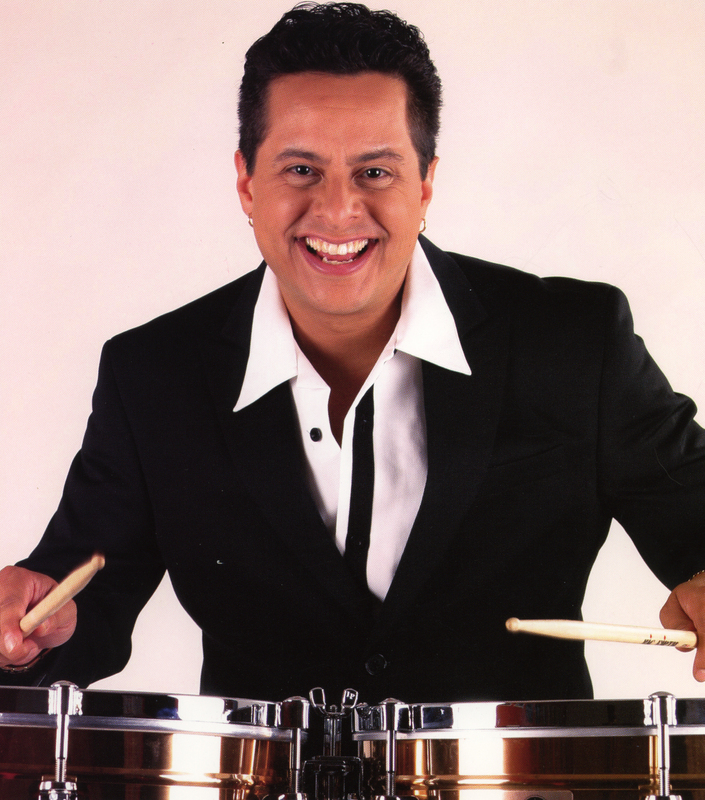 It made people happy all over the world.” – Tito Puente, Jr.
Tito Puente, Jr. is one of three cats in the world of music that I wouldn’t trade places with for anything. By now, you get my point. These guys have chosen to make a living in a musical world where their fathers were not just legends, but transcendent figures. Not only that, they also all bear striking physical resemblances to their dads and they are practicing their art on the same instruments that made their fathers famous. The younger Sinatra, with all due respect has wilted under the pressure. Whereas the other two are more than holding their own. 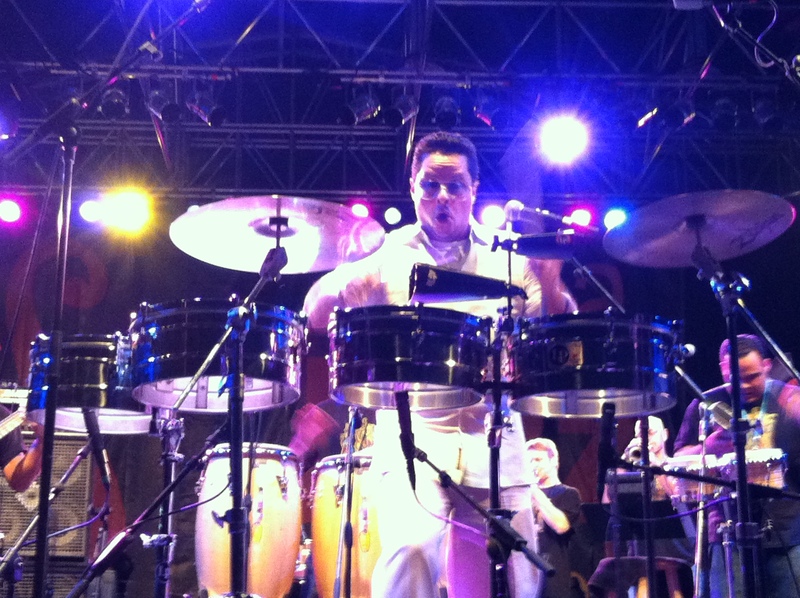 Puente, Jr., who turns 41 in early June, has fully embraced his legacy, as he now leads a band that joyously celebrates his dad by playing many of the songs that made Tito Puente a household name, in addition to some newer tunes that were composed for or by Tito, Jr.
Tito Puente, Jr. will share that gift with us on Sunday night May 27, as he closes the second night of the 2012 Atlanta Jazz Festival with a show that starts at 9 pm. I don’t know if there will be a dance floor, but what the hell, we’ll just make our own!